Dr C Gelbmann, Department of Internal Medicine I, University of Regensburg, 93042 Regensburg, Germany. BACKGROUND/AIMS Intestinal fibrosis and stricture formation is an unresolved problem in Crohn’s disease. The aim of this study was to investigate whether mast cells accumulate in these tissues and whether their localisation is associated with extracellular matrix components. 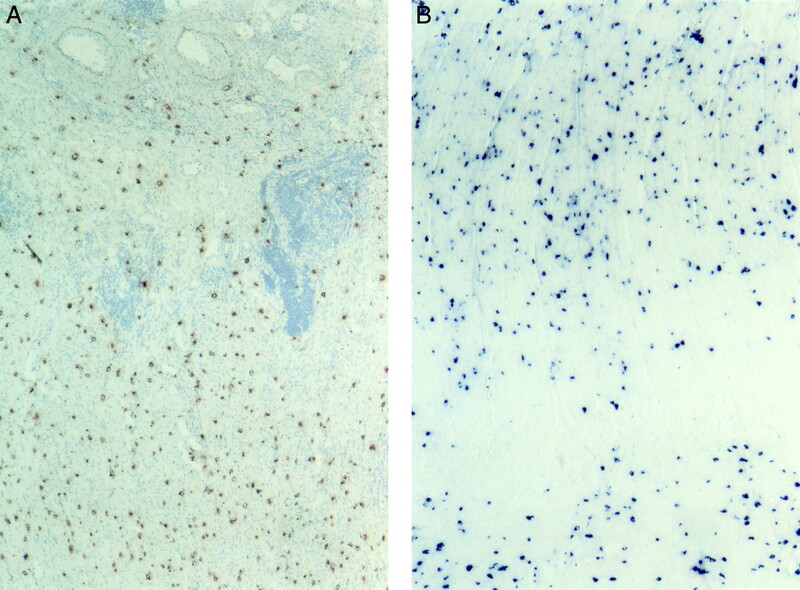 METHODS Mast cells were visualised by immunohistochemical staining of the mast cell specific proteases chymase and tryptase. Their localisation in relation to extracellular matrix components was shown by immunohistochemical double labelling. RESULTS In strictures in Crohn’s disease, a striking accumulation of mast cells was seen particularly in the hypertrophied and fibrotic muscularis propria, with a mean (SEM) mast cell number of 81.3 (14.9)v 1.5 (0.9)/mm2 in normal bowel (p<0.0005). All mast cells in the muscularis propria were colocalised with patches of laminin. In contrast, in the submucosa, laminin was exclusively found in the basal lamina of blood vessels where many adherent mast cells were seen. No colocalisation of mast cells was found with fibronectin or vitronectin. CONCLUSIONS The large accumulation of mast cells in the muscle layer of strictured bowel suggests a functional role for these cells in the hypertrophic and fibrotic response of the smooth muscle cells. The colocalisation with laminin indicates a mechanism of interaction between smooth muscle cells and mast cells that may be important in the role of mast cells in the process of fibrosis. Fibrosis and stricture formation of the bowel is a common complication and hallmark of Crohn’s disease leading to partial or complete obstruction of the lumen, and surgical resection is often required. Deposition of collagen and proliferation of smooth muscle cells are the response to chronic inflammation and injury of the submucosa leading to fibrosis and thickening of the submucosa and the smooth muscle layers of the bowel wall.1 In Crohn’s disease, smooth muscle cells are considered to be the predominant cells involved in the process of stricture formation.2-4 The pathogenesis, factors, and cell types involved in this process are largely unknown. 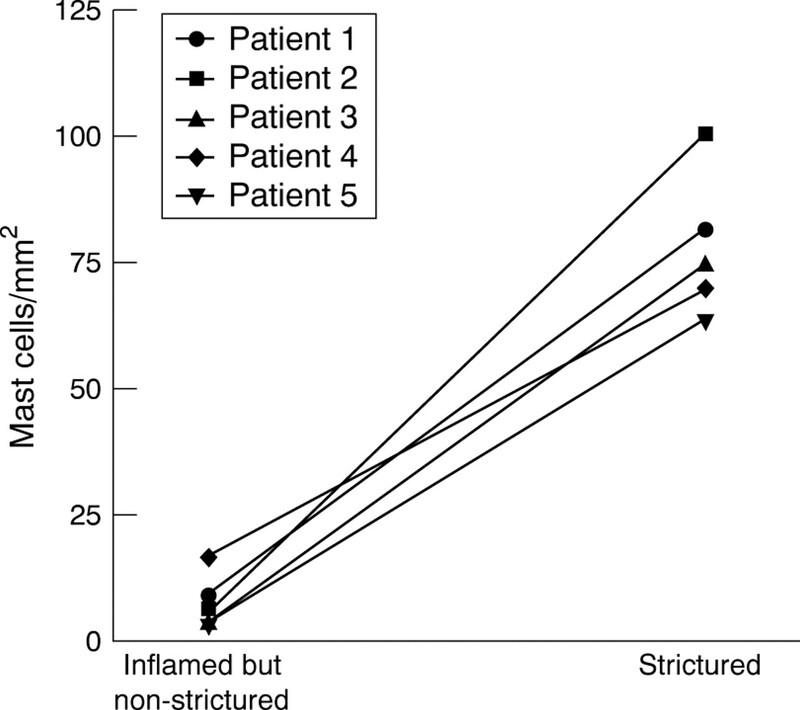 The aim of this study was to assess the distribution, localisation, and quantification of mast cells in the fibrotic intestine, particularly in strictures in Crohn’s disease, and to examine the association of these cells with specific components of the extracellular matrix, fibronectin, laminin, and vitronectin. Surgical specimens were obtained from the Department of Surgery, University of Regensburg and submitted to the Institute of Pathology for routine histological examination. One surgical specimen of ulcerative colitis was obtained from Professor S Werner, Max Planck Institut, Martinsried, Germany. The study was approved by the ethics committee of the University Hospital of Regensburg. The diagnoses of Crohn’s disease (colon n = 8, ileum n = 7), ulcerative colitis (n = 5), and sigmoid diverticulitis (n = 6) were established on the basis of clinical, radiological, and histological criteria. Tissue from involved but non-strictured and strictured colon segments was available from an additional five patients with Crohn’s disease. Normal control tissue was obtained from patients having surgery for bowel cancer (colon n = 8, ileum n = 5). The tissue was stored in liquid nitrogen. Before use, 5 μm cryostat sections were fixed in acetone for four minutes. Table 1 gives the patient characteristics. Slides were rehydrated with Tris buffered saline (300 mM NaCl, 100 mM Tris/HCl, pH 7.4). The slides were then incubated with 1% bovine serum albumin and 3% serum of the animal in which the secondary antibody was raised. Endogenous peroxidase activity was quenched by incubating the slides in 0.3% hydrogen peroxide. Between subsequent steps, slides were washed three times in Tris buffered saline. Mouse monoclonal antibodies directed against human chymase (dilution 1:500) or tryptase (dilution 1:250) (Chemicon, Temecula, California, USA) were used as primary antibodies. The respective negative controls were polyclonal non-specific mouse IgG1 (Dako, Glostrup, Denmark). Biotinylated goat anti-mouse antibody (Vector, Burlingame, California, USA) was used as secondary antibody (dilution 1:750). After incubation with the Vectastain ABC (Vector), a peroxidase substrate solution was applied. For red staining, a freshly prepared solution of 3-amino-9-ethylcarbazole (Sigma, Deisenhofen, Germany; 0.4 mg/ml in 0.05 M acetate buffer, pH 5.0) containing 0.01% hydrogen peroxide was used. For pink staining, the Vector VIP (Vector) substrate kit was applied, and for grey staining the Vector SG substrate kit as recommended by the manufacturer. Staining was carried out as described above except that incubation in hydrogen peroxide was omitted. Instead of the Vectastain ABC peroxidase reagent, the Vectastain ABC-glucose oxidase reagent was used. Staining was developed using nitroblue tetrazolium bromide. 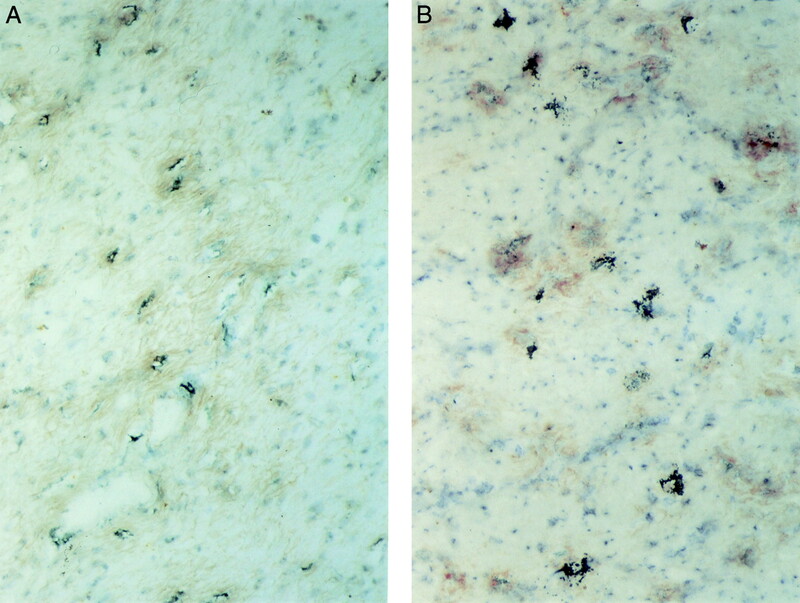 For immunohistochemical double labelling, the peroxidase staining procedure was applied twice to the same tissue section with different antibodies according to the procedure described above. For the initial labelling, monoclonal antibodies (dilution 1:200) to laminin (A chain, B1 chain, or B2 chain), fibronectin, or vitronectin were used and visualised with 3-amino-9-ethylcarbazole (red colour). All antibodies were purchased from Chemicon. For the second labelling, an anti-tryptase antibody or biotinylated anti-chymase antibody was used as primary antibody. If the biotinylated anti-chymase antibody (dilution 1:500; Chemicon) was used, incubation with the secondary antibody was omitted. Mast cells were visualised in a grey/black colour using the Vector SG substrate kit. For control of specific staining an irrelevant polyclonal mouse IgG antibody was used instead of the anti-tryptase and anti-chymase antibodies or instead of the laminin antibody. To test the specificity of the antibodies against laminin, antibodies were preincubated with equimolar concentrations of laminin (human placenta; Sigma) for 30 minutes on ice, which blocked 90% of antibody activity. To exclude the possibility that staining was non-specifically blocked by laminin, we incubated the anti-chymase antibody with the same concentration of laminin. Anti-chymase staining was not affected by the procedure. After being stained, tissues were usually counterstained with Mayer’s haematoxylin (Sigma). Slices of the entire bowel wall (10 mg) were sonicated for five seconds in 500 μl phosphate buffered saline (Bandelin Sonopuls HD70, Berlin, Germany; continuous mode, 45% of maximum power) and then boiled for 10 minutes to release all histamine. Histamine content in the supernatants was determined using a commercially available histamine enzyme linked immunosorbent assay (ELISA) kit (Immunotech, Marseille, France) and was performed according to the instructions of the manufacturer. Mast cell numbers were determined in five adjacent microscope fields in the mucosa, submucosa, and muscularis propria in a blinded manner by two different observers at 200 × magnification. Comparable mast cell numbers were obtained, and the mean cell number was used for statistical analysis. Counts were normalised to 1 mm2. Comparisons between control and diseased bowel were analysed for significance using the Mann-Whitney rank sum test. The results are expressed as mean (SEM). In the normal colon, mast cells were mainly located in the mucosa and submucosa. They were rarely detectable in the muscularis propria, and the few found were usually located in the delicate connective tissue reaching from the submucosa into the deep smooth muscle layer (1.5 (0.9) cells/mm2) (fig 1). In sections taken from strictured colon of patients with Crohn’s disease, mast cells were abundant in the mucosa and submucosa. The most striking difference from normal intestinal tissue, however, was an impressive accumulation of mast cells in the muscularis propria, with highest densities in the area beneath the submucosa and in the outer layer of the muscularis propria. The mean (SEM) number of mast cells was 81.3 (14.9)/mm2 (p<0.0005) (fig 2A,B). 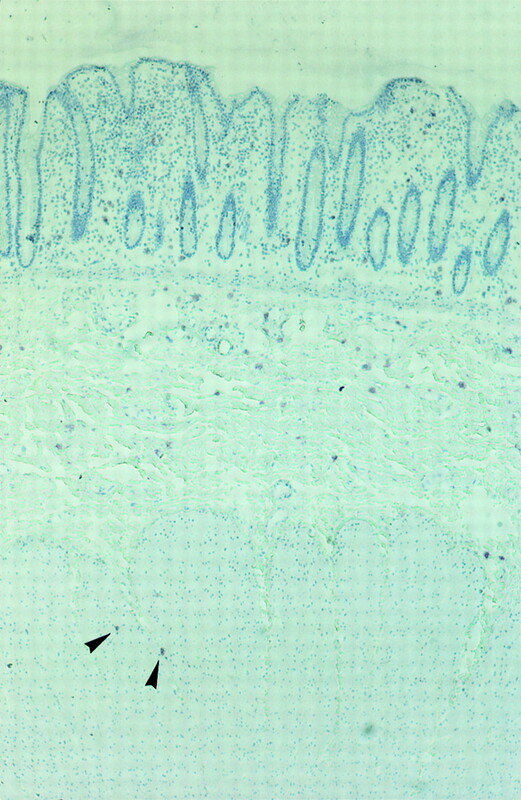 Equal numbers of mast cells were detected in this smooth muscle layer when either an antibody against mast cell specific tryptase or mast cell specific chymase was used, indicating that these mast cells are of the MCTC type, which contain both types of proteases15 16 (fig 3). In the submucosa of fibrotic lesions, mast cell density was also significantly increased in comparison with control bowel: staining for chymase showed 59.7 (7.6) v 29.8 (4.4) cells/mm2, p<0.01 and staining for tryptase showed 53.7 (5.9) v 24.4 (4.1) cells/mm2, p<0.005. In the normal intestine the muscularis mucosae is a thin layer of smooth muscle cells, two to five cells thick and part of the mucosa. In strictured bowel of patients with Crohn’s disease in particular, this muscle layer is considerably thickened by hypertrophy and proliferation, often extending deep into the submucosa. Mast cells were located close to and between the muscle cells of the muscularis mucosae (data not shown). The number of mast cells found in the mucosa of strictured compared with normal bowel was 25.8 (5.8)v 14.7 (3.3)/mm2 for chymase staining and 47.3 (5.2) v 35.2 (3.8)/mm2 for tryptase staining. The difference, however, was not statistically significant. In the tissues examined, about 50–60% of the mast cells in the mucosa stained for tryptase only, and thus were of the MCT type. Distribution of mast cells in normal colonic tissue. Mast cells were visualised by immunohistochemical staining for mast cell tryptase (pink colour) with the biotin-avidin-peroxidase system. The mucosa, submucosa, and muscularis propria are shown. Mast cells are found in the mucosa and submucosa. Hardly any mast cells are detectable in the muscularis propria. Of the two mast cells seen in the muscularis propria (arrows), one is located in a connective tissue septum reaching from the submucosa into the muscle layer. Original magnification ×50. 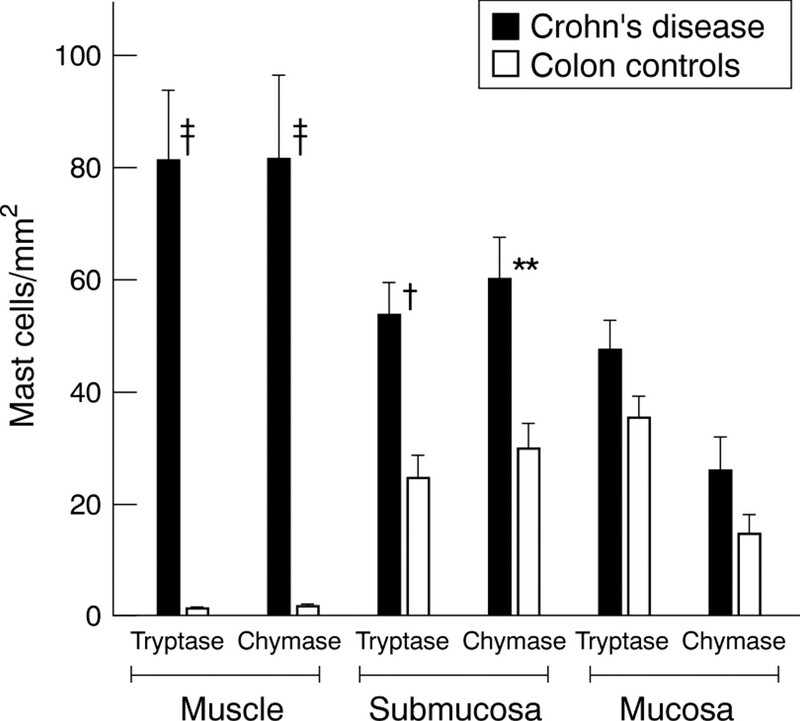 Distribution of mast cells in the muscularis propria in colonic strictures in Crohn’s disease. (A) Mast cells are shown by immunohistochemical peroxidase staining for mast cell tryptase (red colour). An impressive accumulation of mast cells is found in the inner layer of the muscularis propria (lower part of the picture) beneath the submucosa (upper half of the picture). Original magnification ×100. (B) Localisation of mast cells in the inner (top two thirds of the picture) and outer (bottom) layer of the muscularis propria in an ileal stricture in Crohn’s disease. Glucose oxidase staining for chymase was used to detect mast cells (dark blue colour). The highest numbers of mast cells are seen in the inner layer beneath the submucosa and in the outer layer of the muscularis propria. Original magnification ×100. Numbers of mast cells in colonic strictures in Crohn’s disease compared with normal colon. Mast cells were detected by staining for tryptase and chymase. Mast cell numbers were determined in five adjacent microscope fields in the mucosa, submucosa, and muscularis propria at 200 × magnification and normalised to 1 mm2. Mast cell numbers for the three different bowel compartments of strictured colon of Crohn’s disease were compared with those of the respective compartments of normal colon: †p<0.005, ‡p<0.0005,**p<0.01. In the ileum, mast cells were comparably distributed in all three compartments in strictured and normal bowel (fig 4). We found the same accumulation of mast cells in the muscularis propria in strictures of the ileum as we found in the strictured colon. In contrast with the colon, the ileum of normal bowel contained more mast cells in the muscularis propria (colon v ileum of normal bowel: 1.5 (0.9) v 12.2 (2.6) cells/mm2 detected by anti-chymase staining, p<0.05). Numbers of mast cells in ileal strictures in Crohn’s disease and in normal ileum. Mast cells were detected by staining for tryptase and chymase. Mast cell numbers were determined in five adjacent microscope fields in the mucosa, submucosa, and muscularis propria at 200 × magnification and normalised to 1 mm2. Mast cell numbers for the three different bowel compartments of the ileum of Crohn’s disease were compared with those of the respective compartments of normal ileum: †p<0.005, **p<0.01. In the colon and ileum, the highest densities of mast cells in the muscularis propria and submucosa were found when stricture formation of the bowel wall was pronounced with a thickened muscle layer and an expanded fibrotic submucosa. In these cases the muscularis propria also showed appreciable fibrotic changes with enhanced collagen depositions. Histamine as the major mediator of mast cells is released upon appropriate stimulation. Histamine content in tissues correlated with the number of mast cells present. Determination of the histamine concentration in sections through the entire intestinal bowel wall of the colon and ileum showed significantly higher values for Crohn’s disease compared with control bowel (377.2 (109.8)v 88.3 (12.3) ng/10 mg tissue, p<0.005). In the muscularis propria of inflamed but non-strictured colon of Crohn’s disease, only small numbers of mast cells were found (8.2 (2.4) cells/mm2) (table 2). In individual patients mast cell numbers increased markedly in strictured bowel segments (fig 5). The average mast cell number in the muscularis propria of strictured bowel segments was 78.2 (6.3)/mm2 (p<0.008, compared with inflamed but non-strictured bowel). In the mucosa and submucosa, mast cell numbers were slightly higher in strictured than inflamed but non-strictured bowel, but numbers were not significantly different, in striking contrast with cell numbers in the muscularis propria (table2). Numbers of mast cells in the muscularis propria of involved but non-strictured bowel compared with strictured bowel segments of five individual patients. Mast cells were visualised by staining for tryptase, and numbers represent cells counted in five adjacent fields at 200 × magnification normalised to 1 mm2. In ulcerative colitis chronic inflammation is predominantly found in the mucosa. Deeper layers of the bowel wall are usually not involved in the inflammatory process and stricture formation is rarely seen. In sigmoid diverticulitis some fibrosis of the submucosa and muscularis propria can be observed. In these two conditions, slightly increased mast cell numbers were found in the muscularis propria, but only those in diverticulitis were significantly different from normal control bowel sections (12.5 (2.7) v 1.5 (0.9) cells/mm2, p<0.005). 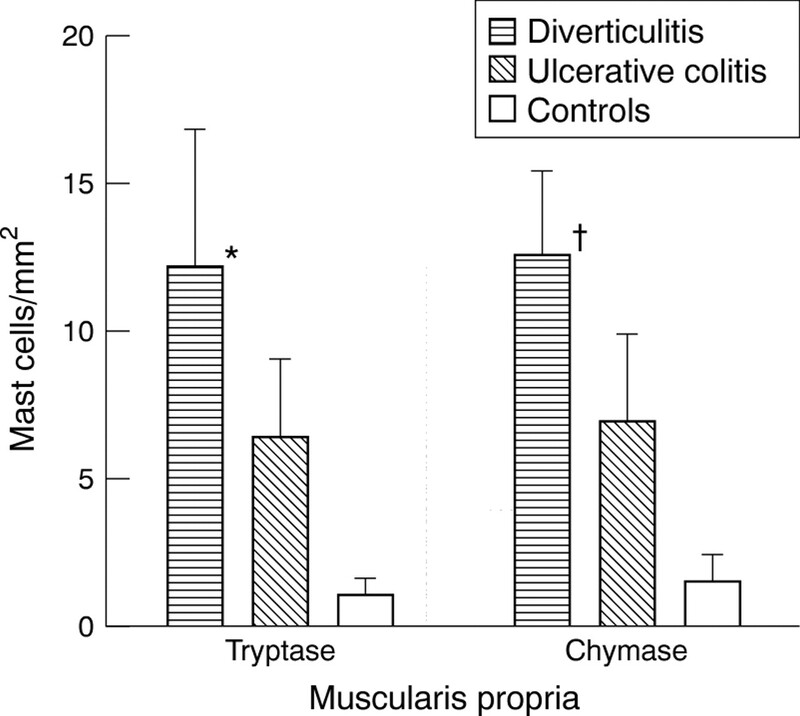 In ulcerative colitis mast cell counts in the muscularis propria were not significantly different from control bowel (fig 6). Numbers of mast cells in the muscularis propria in the colon in ulcerative colitis and sigmoid diverticulitis and in normal colon. Mast cells were detected by staining for tryptase and chymase and counted in five adjacent fields and normalised to 1 mm2. Only numbers of mast cells in sigma diverticulitis were significantly different from those in normal colon: *p<0.05, †p<0.005. To study the relation of mast cells to extracellular matrix components, three matrix proteins were used: fibronectin and vitronectin, the abundant matrix proteins, and laminin, the principal matrix protein of the basement membrane. In fibrotic strictures of Crohn’s disease, laminin was accumulated in a patchy pattern in the muscularis propria. Immunhistochemical double labelling disclosed that all mast cells found in the muscularis propria were colocalised with these patches of laminin (fig 7A). Mast cells were located in the centre of the accumulated laminin (fig 7B). In the submucosa, laminin was exclusively found in the blood vessel vascular basement membranes, and many of the submucosal mast cells were attached to the basal lamina of blood vessels (fig 7C). The prominent colocalisation of each single mast cell with patches of laminin, however, was not seen in the submucosa. In normal bowel the distribution of laminin in the submucosa was similar. No depositions of laminin were found in the muscle layer (fig 7D). Localisation of laminin and mast cells in strictured and normal colon. Immunohistochemical double staining was used to demonstrate laminin (red colour) and mast cell chymase (grey colour). (A) Shown is the muscularis propria of a fibrotic stricture of the colon in Crohn’s disease. Patches of laminin (red colour) are colocalised with mast cells (grey colour). Original magnification ×200. (B) In the muscularis propria, mast cells (grey colour) are located in the centre of laminin deposits (red colour). Original magnification ×400. (C) Distribution of laminin and mast cells in the submucosa in the same fibrotic stricture. Laminin is mainly located in the basal lamina of blood vessels where many adherent mast cells are found. A small part of the inner layer of the muscularis propria is shown in the left lower corner. Original magnification ×100. (D) Localisation of laminin in the normal colon. Laminin is found in the basal lamina of blood vessels in the submucosa (top of the picture). There are no laminin deposits and no mast cells in the muscle layer (lower part of the picture). Original magnification ×10\. Laminin is a heterotrimer consisting of α, β, and γ chains.17 The colocalisation of mast cells with laminin was shown with three different monoclonal antibodies against the laminin A (α1), B1 (β1), and B2 (γ1) chain (data not shown). In chronic sigmoid diverticulitis with mild fibrosis, the mast cells found in the deep muscle layers showed a similar association with laminin to that in Crohn’s disease. Also, the same colocalisation was observed for the few mast cells scattered in the muscularis propria in ulcerative colitis (data not shown). In Crohn’s disease, deposition of fibronectin and vitronectin in the large muscle layers and to a smaller extent in the submucosa was enhanced compared with control tissue. The distribution was diffuse, and mast cells were preferentially located in these areas (fig 8A,B). However, there was no strict colocalisation of mast cells with fibronectin or vitronectin. Deposition of fibronectin and vitronectin in the muscularis propria in colonic strictures in Crohn’s disease. (A) Fibronectin (red colour) is diffusely distributed in the muscle layer. There is no strict colocalisation with mast cells (grey colour). Original magnification× 200. (B) Vitronectin (red colour) is spotted in the muscle layer. No colocalisation with mast cells (grey colour) is seen. Original magnification ×200. In this study we show a striking accumulation of mast cells in the submucosa and particularly in the circular and longitudinal layer of the thickened muscularis propria of fibrotic strictures in Crohn’s disease compared with the normal colon where almost no mast cells were found in the muscle layers. In sigmoid diverticulitis, in which some fibrosis occurs, and in involved but non-strictured bowel of Crohn’s disease, mast cell numbers were slightly elevated in the muscularis propria. In ulcerative colitis, another chronic inflammatory condition not characterised by extensive intestinal fibrosis, mast cells counts were not significantly different from those in normal bowel. These findings suggest that the abundance of mast cells found in the smooth muscle layer of fibrotic intestinal strictures correlates with the process of stricture formation characterised by extensive fibrosis of the submucosa and hypertrophy and thickening of the muscle layers. The dynamic interaction of cells with certain extracellular matrix components is essential for cell adhesion, migration, differentiation, and biological function.23 In particular, laminin mediates multiple biological activities, including migration, cell spreading, differentiation, and cytokine production.24 25 In this respect our most striking finding was that, without exception, all mast cells in the muscularis propria were colocalised with laminin. This was also found for the mast cells of the hypertrophied muscularis mucosae in strictured bowel. Mast cell colocalisation with laminin was not specific for Crohn’s disease. In sigmoid diverticulitis and ulcerative colitis, the mast cells seen in the muscle layers were also colocalised with laminin. We therefore suggest a causative relation between smooth muscle cell, mast cell, and laminin, and this relation is particularly obvious in the context of chronic inflammation and the process of stricture formation. Mast cells were located in the centre of the laminin deposits, suggesting the mast cell itself or the surrounding smooth muscle cells or both cell types as its source. The extent of production could be dependent on the degree of inflammation of the neighbouring submucosa and the extent of the fibrotic process in the submucosa and muscle layers. The mast cell-laminin interaction could mediate differentiation, specific cellular function, and anchoring of mast cells in the muscle layer. What can be learned from animal models? Mouse mast cell precursors have the ability to adhere to laminin before expression of phenotypic characteristics other than IgE, enabling them to localise in tissues where they may then develop their final phenotype depending on the local environment.26 Thompson et al 27 showed that certain murine mast cell lines and cultured murine mast cells, upon appropriate stimulation, express laminin receptors and adhere to and spread on laminin in vitro. A specific amino acid sequence in the A chain of laminin was found to promote this process.28 In addition, murine mast cells have been shown to synthesise components of basement membranes including laminin and collagen IV.29 Vliagoftis and Metcalfe30 recently showed that physiological stimulation promoted mast cell attachment to laminin mediated by α6 integrin and that interaction of mast cells with laminin enhanced their mediator release after activation by FcεRI. Although one has to be very cautious in extrapolating these results, one could speculate that the mast cell-laminin interactions in particular may influence mast cell functions important for the fibrogenic process, such as mediator release, cytokine production, and response to chemotactic factors. This is supported by the finding that human mast cells required laminin for chemotaxis in response to the complement peptides C3a and C5a.31 In addition, spontaneous adhesion of human skin mast cells to laminin and fibronection has been reported.32 We also found in preliminary experiments that human intestinal mast cells isolated from the mucosa and submucosa of normal bowel adhered to laminin without prior stimulation. Stricture formation in Crohn’s disease is a serious unresolved problem, and no preventive treatment is available. There is evidence that mast cells are involved in the fibrogenic process. Unravelling of the molecular events leading to accumulation, differentiation, and activation of intestinal mast cells may provide important information on the complex mechanisms leading to intestinal fibrosis and stricture formation. C M G and S M contributed equally to this work. These studies were supported by a grant from the Deutsche Forschungsgemeinschaft. (1995) Pathogenesis of intestinal strictures in Crohn’s disease: an update. Inflammatory Bowel Disease 1:220–227. (1988) Collagen content and types in the intestinal strictures of Crohn’s disease. Gastroenterology 94:257–265. (1980) Crohn’s disease: transmission electron microscopic studies. III. Target tissues. Proliferation of and injury to smooth muscle and the autonomic nervous system. Hum Pathol 11:620–634. (1992) Cellular localisation of procollagen gene transcripts in inflammatory bowel disease. Gastroenterology 102:431–442. (1997) The pathology of fibrosing colonopathy of cystic fibrosis: a study of 12 cases and review of the literature. Hum Pathol 28:395–399. (1997) Increased transforming growth factor β (TGF-β) immunoreactivity is independently associated with chronic injury in both consequential and primary radiation enteropathy. Int J Radiat Oncol Biol Phys 39:187–195. (1995) Mast cell role in fibrotic diseases. Isr J Med Sci 31:450–453. (1995) Mast cells: accessory cells which potentiate fibrosis. Int Rev Immunol 12:259–279. (1995) Hepatic involvemement in mastocytosis: clinicopathologic correlation in 41 cases. Hepatology 22:1163–1170. (1991) The role of the mast cell in clinical gastrointestinal disease with special reference to mastocytosis. J Invest Dermatol 96:40S–44S. (1991) Systemic mast cell disease: a review of the literature with special focus on the gastrointestinal manifestations. Acta Clin Belg 46:226–232. (1996) Molecular variants of fibronectin and laminin: structure, physiological occurence and histopathological aspects. Virchows Arch 429:311–322. (1993) The laminin family. Curr Opin Cell Biol 5:877–882. (1991) Structure and biological role of vitronectin. Annu Rev Cell Biol 7:275–310. (1994) The immunhistochemical demonstration of chymase and tryptase in human intestinal mast cells. Histochem J 26:587–596. (1986) Two types of human mast cells that have distinct neutral protease compositions. Proc Natl Acad Sci USA 83:4464–4468. (1988) Laminin, a multidomain protein. J Biol Chem 263:16536–16542. (1980) Crohn’s disease: transmission electron microscopic studies. II. Immunologic inflammatory response. Alterations of mast cells, basophils, eosinophils, and the microvasculature. Hum Pathol 11:606–619. (1997) Cleavage of type I procollagen by human mast cell chymase initiates collagen fibril formation and generates a unique carboxyl-terminal propeptide. J Biol Chem 272:7127–7131. (1995) Tryptase, the dominant secretory granular protein in human mast cells, is a potent mitogen for cultured dog tracheal smooth muscle cells. Am J Respir Cell Mol Biol 13:227–236. (1997) Mast cell tryptase regulates rat colonic myocytes through proteinase-activated receptor 2. J Clin Invest 100:1383–1393. 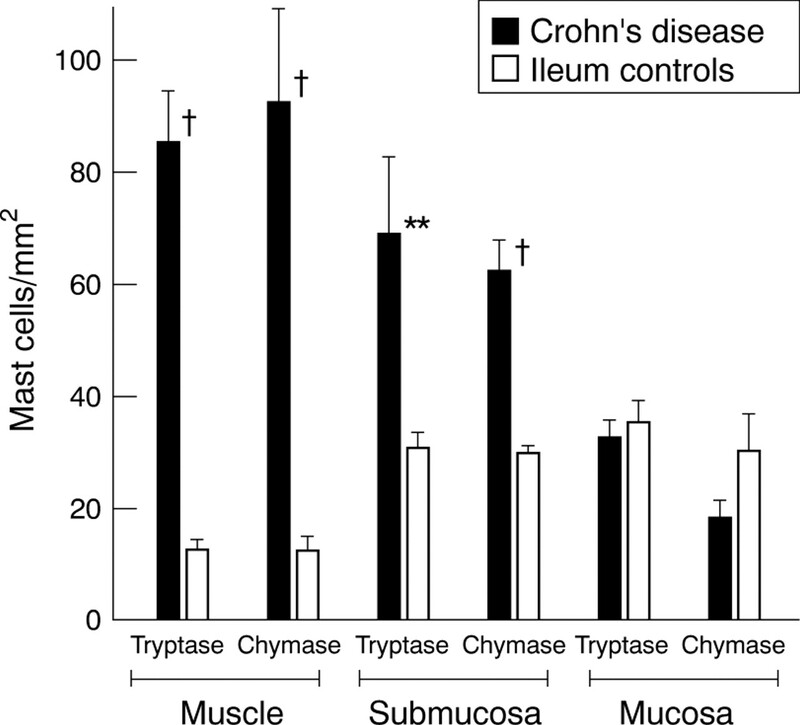 (1993) Altered small intestinal smooth muscle function in Crohn’s disease. Gastroenterology 104:1692–1699. (1995) Extracellular matrix proteins and leukocyte function. J Leukoc Biol 57:699–702. (1992) The role of laminin in attachment, growth, and differentiation of cultured cells: a brief review. Cytotechnology 9:99–106. (1993) Beta 1 integrin-mediated interaction with extracellular matrix proteins regulates cytokine gen expression in synovial fluid cells of rheumatoid arthritis patients. J Exp Med 177:863–868. (1990) Regulation of adhesion of mouse bone marrow-derived mast cells to laminin. J Immunol 145:3425–3431. (1989) Laminin promotes mast cell attachment. J Immunol 143:2323–2327. (1991) Identification of an amino acid sequence in the laminin A chain mediating mast cell attachment and spreading. Immunology 72:144–149. (1991) Murine mast cells synthesize basement membrane components. A potential role in early fibrosis. J Clin Invest 87:619–623. (1997) Characterization of adhesive interactions between mast cells and laminin isoforms: evidence of principal role for α6 integrin. Immunology 92:553–560. (1997) C3a and C5a stimulate chemotaxis of human mast cells. Blood 89:2863–2870. 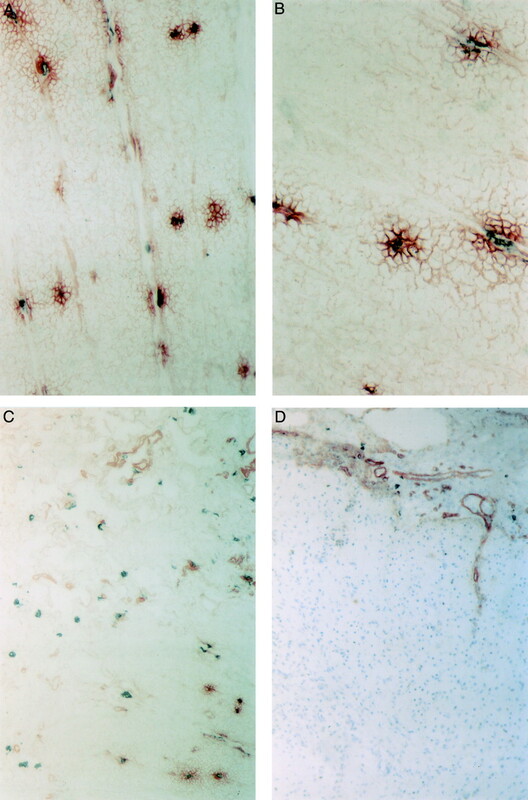 (1995) Human skin mast cells express functional beta 1 integrins that mediate adhesion to extracellular matrix proteins. J Immunol 154:6058–6064.